Post pics your aftermarket wheels. Include brand/model info and sizes if possible (diameter, width, offset) and tire size. 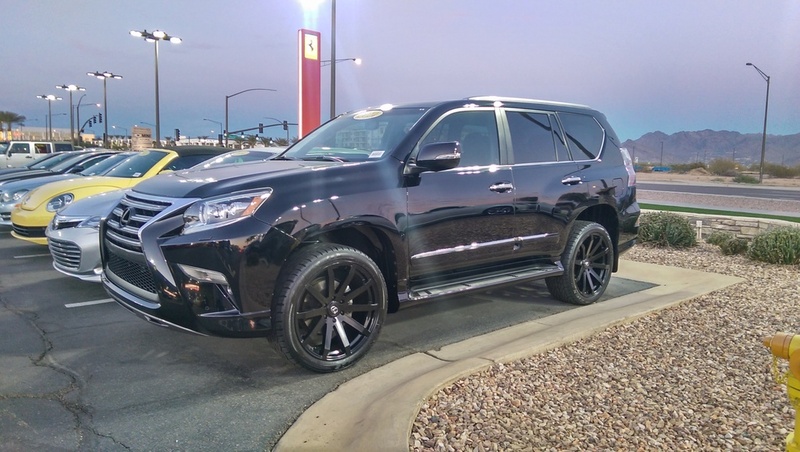 I'll start.......just bought this 2014 Luxury, it came with these Black Rhino Traverse 22x9.5 (offset+25) wheels and black pearl GX460 and "L" emblems. Tires are Falken Ziex S/TZ05 in size 285/40-22. 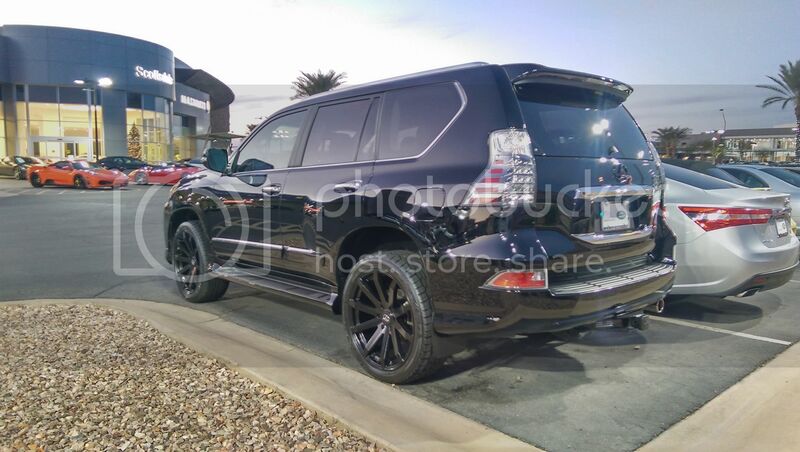 I don't have any experience riding on the 18" stockers so can't compare the ride but I have no major complaints about the 22's (I'm coming from a 2001 LS430 I had for 12 years). I may decide to drop down to 20's in the future to reduce some unsprung weight. I'd like to see how some of these OEM styles look on the GX in the larger diameters. Last edited by 96redvette; 11-14-16 at 05:44 AM. I am looking forward to watching this thread in the future. 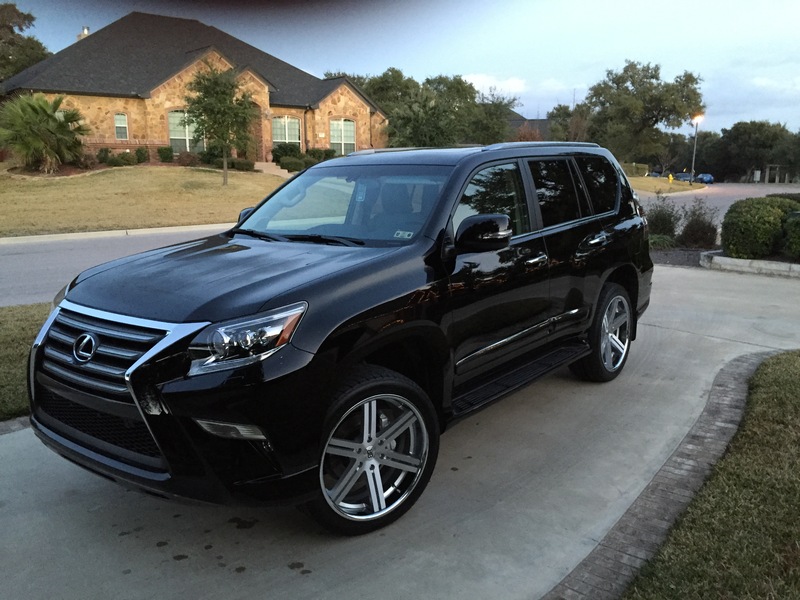 I just got delivery of a 2016 GX460 before Christmas and one of the funny quirks about the 2016s in Canada is how they packaged the options and the wheels. For 2016 they stopped bringing in the base model and they give you three choices; Luxury ($69,500), Technology ($72,500), and Executive (~$78,000). I opted for the Technology package, because for ~$3K more it gives you all of the luxury options, plus all the drive assist of the executive package (LDA, Radar Cruise, Wide-View/Side view; driver monitor etc.). The executive package adds the cool box, skid plates and rear TVs for another ~6K. So for now, I have the base wheels running my snow tires and will be looking to find a set of OEM lux wheels for the summer tires or maybe something aftermarket. Looking forward to some inspiration - and if anyone wants to sell me their OEM graphite wheels - send me a message! Check out that link I posted to some of the hyper-black OEM-style wheels from Wheel Genius. I think the OEM look in a 20" size would look great! 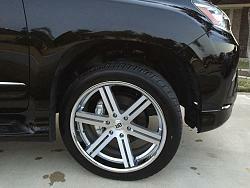 The factory 4 Runner 20" wheels are only 7" wide whereas the ones above are 8.5". Awesome, let's keep this thread going--stock wheels are pretty boring on this car. Stock size is 18x7.5 with 52mm offset. Does anyone have an opinion on how wide of a wheel would work with the stock tires? Is 8.5 inches too wide? My 1.25 inch spacers were good until I had the Pirelli Scorpion Zero P265/40R-22 installed. Now I have rubbing. There is little play on size with the GX. 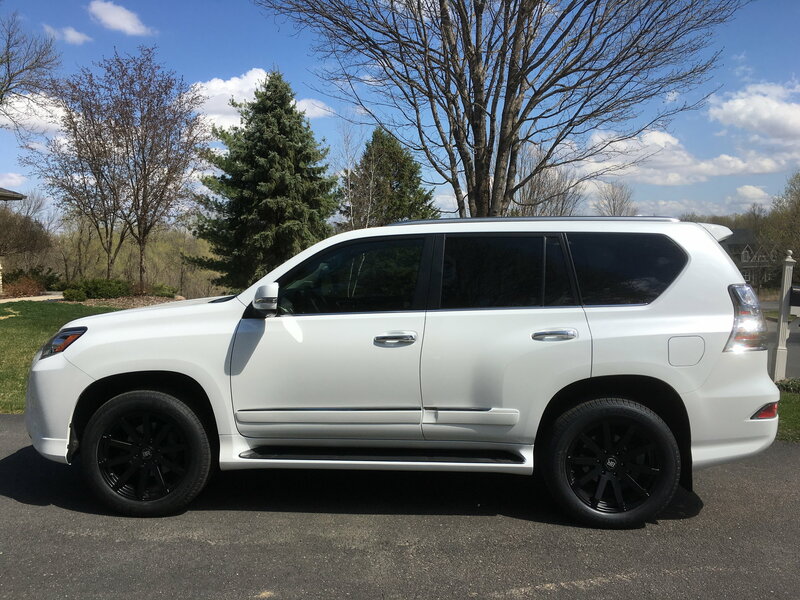 I called Rimz One and they told me that +18 offset would be right for the GX (I'm getting after market 18 x 9 Mayhems) and will allow me to go up a tire size to 275/65/18 from the stock 265/60/18. In fact, they said I should be ok even if I went to 285/60/18, but I'm a bit concerned about the additional width of that tire causing more wheel rub than the 275/65's, despite the latter having a greater diameter. I don't want to have to put spacers if I dont' have to. I know of one guy who got KO2's at 275/65/18 that he had put on his existing stock 18 x7 wheels, and isn't having any significant issues with rub. 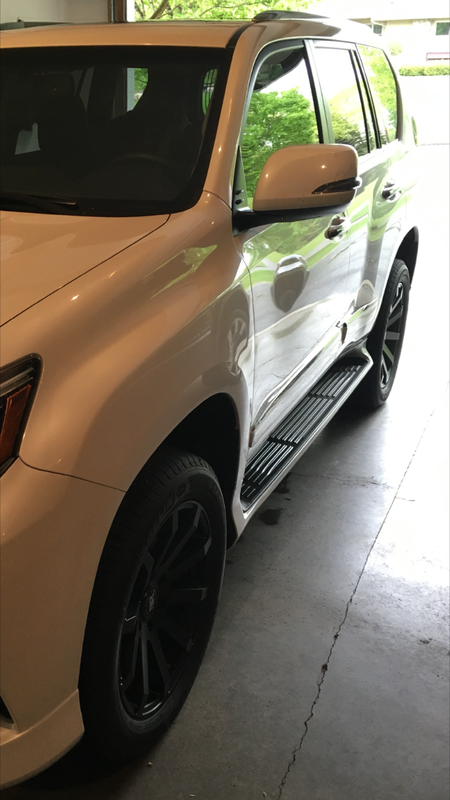 2014 GX460 base added Black Rhino Traverse 20x9 15mm offset about a month ago. I did not want a really low profile looking tire so went with 285/50r20. I am happy with the size. It rubbed twice on passenger side wheel well screw. I changed that to a more flush screw and has not rubbed since. I did a lot of research on this forum before buying that tire size. This is my first post and wanted to thank everyone here for the info. Looks good! Got any pics from the front or rear at an angle so I can see how the offset looks? I think I may drop down to these in 20" instead of the 22" I currently have. Also, what brand tires did you go with? Last edited by jpcdmd; 05-11-16 at 09:37 AM. Did you lower it also? I agree with black wheels being hard to see the design but I like the contrast on the white vehicle. I did not lower it probably looks that way because the 285/50/20 fill the fenders more. I went with Michelin Lattitude tours because of a special and could not beat the price. 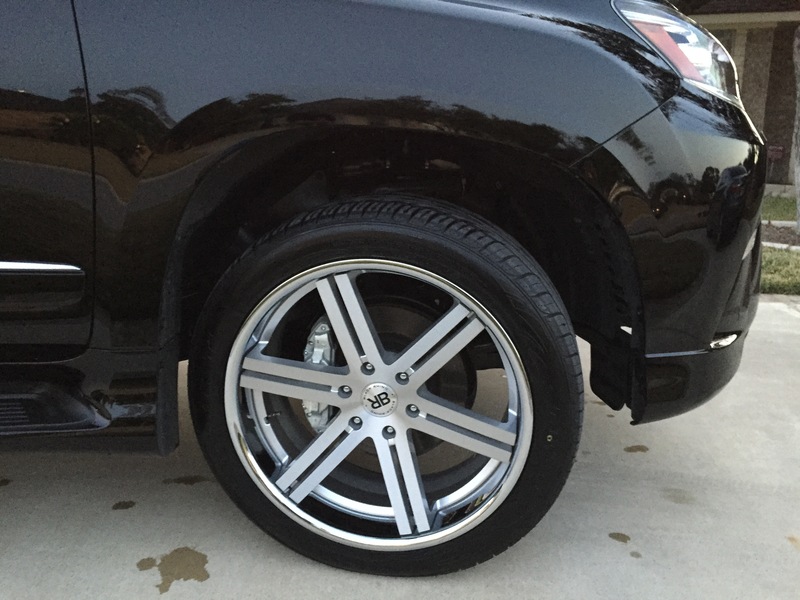 Have you tried the Butler's High Speed on the Car Wheel Balancing on your 22" rims? Is it a major improvement over traditional balancing? I just got my tires changed on my 24" rims but experiencing shimmy vibration at 60MPH. Should I pay the extra fee for that exclusive service at Butler? Btw, did you get a resolution on your exhaust system with the spare tire mounted back on? I like your setup but I prefer to keep the spare. Nope on the exhaust. Thinking of renting a truck for a few days and give mine to the guys I use, Japanese Automotive. I will give them my spare so they can see if something can be done with the routing. Maybe a smaller tire? I will have them fix my overhead wiring F-up that killed my remote start and let me lock my fob in my truck. I will also have them look into my balancing problem and get a new water pump while she's in. Did they take into consideration your wheel adapters when they did the balancing? How bad is the vibration @ 60MPH? Is the vibration noticeable at other speeds? linked to the leaning issue?